Adam Saleh is known for his elaborate pranks on YouTube, but he claims what happened to him on a Delta Air Lines flight is no joke. Delta released a statement Wednesday after a YouTube star who is famous for hoaxes posted a video on social media accusing the airline of discrimination after he spoke in Arabic on a flight. 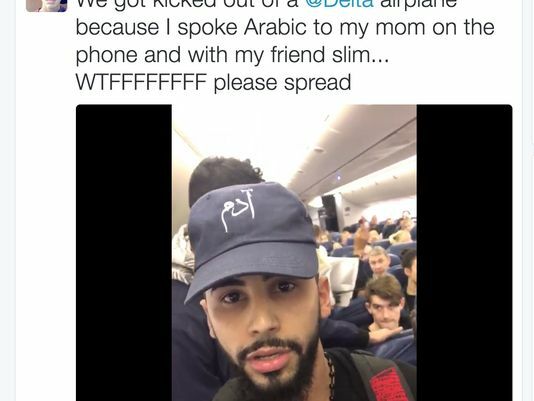 Adam Saleh, who has risen to fame for elaborate pranks, posted on Twitter that he and a friend were kicked off of a Delta flight after speaking in Arabic. “We got kicked out of a @Delta airplane because I spoke Arabic to my mom on the phone and with my friend slim,” he said in a Tweet. Delta says there is more to the story. "Based on the information collected to date, it appears the customers who were removed sought to disrupt the cabin with provocative behavior, including shouting," Delta said in a statement Wednesday. "This type of conduct is not welcome on any Delta flight. While one, according to media reports, is a known prankster who was video recorded and encouraged by his traveling companion, what is paramount to Delta is the safety and comfort of our passengers and employees. It is clear these individuals sought to violate that priority." In a video posted on Twitter, Saleh records himself as he is escorted off the plane. In the video, several passengers clap and say “bye,” as the duo walks down the aisle. ‘This is 2016. 2016. Look Delta airlines are kicking us out because we spoke a different language,” he said. Who is YouTube prankster Adam Saleh from the Delta Airlines drama? On social media, many slammed Delta while others questioned the validity of Saleh's account. Others pointed to videos Saleh recorded months ago titled "Counting down in Arabic on a plane experiment" and "Never wear this on a plane in America." A spokesperson for Saleh told USA TODAY that the incident was not a prank. He said the YouTuber was traveling from Heathrow Airport back to New York City after completing the first half of his world tour when the incident occurred. "Adam made a phone call to his mother to let her know that he will be home in the next 7-8 hours after his flight and because Adam's mum only speaks Arabic, he was speaking to her in his language," according to the statement. "Unfortunately this caused a problem amongst other passengers in the airline who got angry and started abusing him swearing and saying that they felt threatened." The airline said the passengers were later rebooked. Saleh said he and his traveling companion were taken to security and checked before getting on another flight with a different airline.